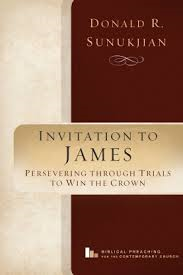 Sunukjian, Donald R. Invitation to James, Persevering Through Trials to Win the Crown. Wooster, OH: Weaver Book Company, 2014, 123 pp. This book is part of a series that the author is working on to show how he preaches and practices what he teaches. The series is, Biblical Preaching for the Contemporary Church. The purpose of the series is to offer models of the principles presented in the textbook (p. xi). It is the complement of his work, Invitation to Biblical Preaching. There is an introduction to the book of James and then fourteen chapters of sermons. There is no bibliography which would have been a nice addition. Knowing the tools he used to prepare his sermons would have been helpful to preachers. The reader has to keep in mind that this is not a commentary but a collection of sermons. When necessary the author uses footnotes. Sunukjian is trying to show preachers how to make the sermon true to the text while connecting with modern society. Even though the sermons have been edited to fit the book format they were preached to his congregation. Since I have not read his textbook my approach to this was more devotional. With that in view it was a good read. Every pastor should read or listen to sermons on a regular basis. Pastors have to grow spiritually and sometimes they have a hard time listening to others preach the Word. This book will help fill that void. There were chapters that ministered to me and helped me. One in particular was very timely. My reading approach was more devotional than technical and I was blessed. Had I been looking for something more technical I would have been disappointed. Students who use his textbook would find this series helpful in practical ways too. They could see how Sunukjian practices what he teaches. It seems it would be a good complement to his textbook. This book will give students a chance to see how a skilled preacher delivers the Word to modern listeners. Balance that thought with the knowledge that there are other skilled preachers who may preach differently. Overall it was a good read and I would recommend it to other pastors and students. My recommendations would be for different reasons because I see each group differently with different needs. I would be interested to see how he handles topics and characters as well. I received this book for free from www.crossfocusedreviews.com for reviewing purposes and was not obligated to give a good review.